Instagram, the popular photo-sharing app, drew a $1bn price tag when Facebook came knocking back in April. It is a massive leap of faith to pay this much for a company lacking that pesky thing that is a revenue model, but equally, it is a powerful signal as to the importance of photos in the new social internet future. So then why is it that just four months earlier, the inventor of the hand-held camera filed for bankruptcy? It is not like people had lost interest in photography, the lifeblood of Kodak, in fact quite the opposite. When it folded, Kodak was worth almost exactly as much in cash as Instagram was worth in dreams. Instagram was funded on just $500,000 back in October 2010, with a second round in February 2011 bringing onboard $7m from big-name investors. Of course we have the benefit of hindsight, but it would have been so easy for Kodak to make its own Instagram. So why did they not? To be fair, Kodak had not exactly been sitting on its hands in the run-up to the bankruptcy; the 133-year-old company actually now draws 75% of its income from digital businesses. While change is constant, the current technological leap is bigger than usual: the coming of age of the internet means photography becomes digital, newspapers go online, music is available for immediate download, and books are read on e-paper. While Kodak had the money to try new things, it would seem that it did not quite have the courage to shake things up to the extent that was really necessary to survive. Before Oliver Roup founded VigLink, the web-content monetisation software group in 2009, he was in charge of products for Microsoft’s media outfits such as XBox Live Video Marketplace and MSN Entertainment. At the time of our meeting in San Francisco, Roup’s idea had grown into a 22-people-strong operation. So why did he leave Microsoft to do this? “The main reason I left was to get more autonomy. I wanted to build something of my own,” said Roup. When looking ahead at the kinds of projects he would be working with at a big company like Microsoft, he found they paled in comparison with the excitement of entrepreneurship. But from the point of view of his former employer, why were they not bending over backwards to give industrious employees a chance to develop new ideas in-house? “The thing is that their interests and goals are different. I think a company like Microsoft, if they could create a business worth a $100m a year, that is not even worth it to them. The intellectual overhead of even thinking about it …” Roup shrugged, but quickly added that this is not a reflection of incompetence nor malevolence on part of a big organisation: “Priorities shift when you are already making $60bn in revenues. In order to move the needle and impress your investors you have to make strides that are material to that number, and that’s a very hard thing to do.” In other words: they are looking for guarantees, and with start-up adventures there is no such thing. 76 year old Spirent, the technology testing group operating out of Silicon Valley, only needs to point to its age to demonstrate its skills as an innovator. Successful acquisitions have played an important part for the Crawley-born company: the 2002 acquisition of Caw Networks, which makes network performance testing appliances, gave the group a foothold in a growing niche, while the same is hoped to be the case for Mu Dynamics, a cloud- and app-testing specialist brought onboard earlier this year. “But acquisitions are always challenging. You have a different culture and you have a product that is fairly typically early in its life cycle. You have to nurture the relationship, the culture and the product area, and they are not always successful,” CEO Bill Burns said as we met in his Sunnydale office. The challenge of being able to predict which trend will spark and catch fire is immense, and even if you get the trend right, the technology may be wrong. Take Cisco’s acquisition of Flip, the little pocket camera, which came at a time when personal videos and YouTube were booming. Cisco was right about the trend, but it was the smartphone that would become people’s recording device of choice. Burns added: “You wonder if a Kodak could have done something around enhancing photo activity. Could they have sold the intellectual property around cameras in smartphones? 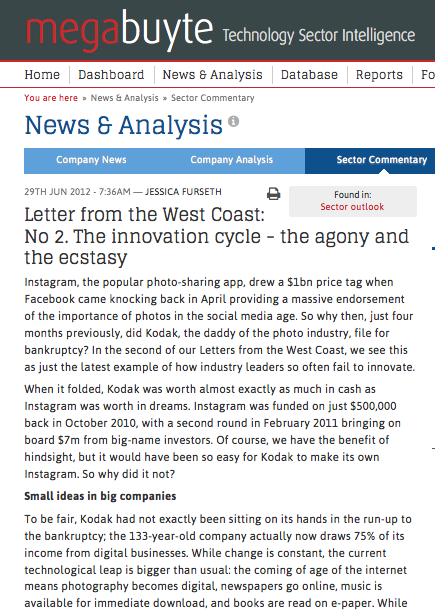 Could they have turned themselves into a web service around photo processing?” Not knowing exactly which trend was going to be the winner, Kodak hesitated too long and ended up missing the boat. Eric Kessler, co-president of cable TV channel HBO caused a stir last month when he said he thinks the move away from traditional TV to an internet-based model is just a “temporary phenomenon”. Consider then the fact the HBO series “Game of Thrones” is rapidly becoming the most pirated TV show of all times, with over 25 million downloads this spring as HBO refuses to let people pay for new episodes on Netflix, Hulu or iTunes. The fact that it is difficult for established companies to take chances is also part of what creates opportunities for start-ups. For young software companies, providing a pure Cloud offering from day one means they come across as modern and nimble, unencumbered by transitional issues. These remain a source of unending distractions for the incumbents as they try to keep everyone – new and old customers, as well as investors – happy, while they try and keep up with neverending change. But as a company grows and the management becomes invested in the status quo, is it possible to maintain that start-up spirit? “The start-up spirit was essential to us when we were tiny, we would not have survived without it. But it is hard to keep working at the pace and intensity of a start-up forever,” said Suranga Chandratillake, CEO of video search software outfit Blinkx. For large companies it is possible to throw money at the problem and buy what looks good from the upstart pool, and then strive to find the right balance between nurturing the growing company and leaving the entrepreneurs at the helm alone as much as possible lest they feel stifled and leave. As Microsoft is looking to pay as much as $1bn for Yammer, it is hard not to be fearful: what if the tech giant starts stomping around at Yammer, imposing rules and processes and demanding ties instead of jeans. After meeting Adam Pisoni, co-founder and CTO at Yammer, it is hard to picture him being happy as a cog in the Microsoft machine. “The thing that excites me [about running a start-up] first of all is the idea that we can build products that people want to use. I recognise that that is a bit vain, even,” said Pisoni. “The other part is feeling like you can build a better company. That you cannot only build a better product, but you can build a company that is sustainable, that is a better company than those who have done it before.” Before establishing Yammer just four years ago, Pisoni was software architect at Geni; he was instrumental in the systems architecture at Shopzilla; he co-founded web development consultancy, Cnation, which serviced big names such as CBS, Fox, Nissan and Honda. Posted on 06/29/2012 by Jess. This entry was posted in Business features, Technology features. Bookmark the permalink.